This morning I woke up with major lack of motivation and a dose of home sickness. All I wanted to do today was get into my panda onesie and curl up on my mum’s sofa watching rubbish TV. Instead, I finally made myself get out of bed (I was awake super early because of a marching band that didn’t seem to march anywhere except outside my hostel for four hours!) and head out for a walk. I found myself at the hand craft market being assaulted by colours and offers to purchase anything and everything. There was a performer playing the pipes and children running up and down. The hubbub was strangely comforting and I found myself walking round and round for ages. In the end I decided it was the right time to commit to my next bracelet and the mandatory fridge magnet before heading off for further wandering and food. 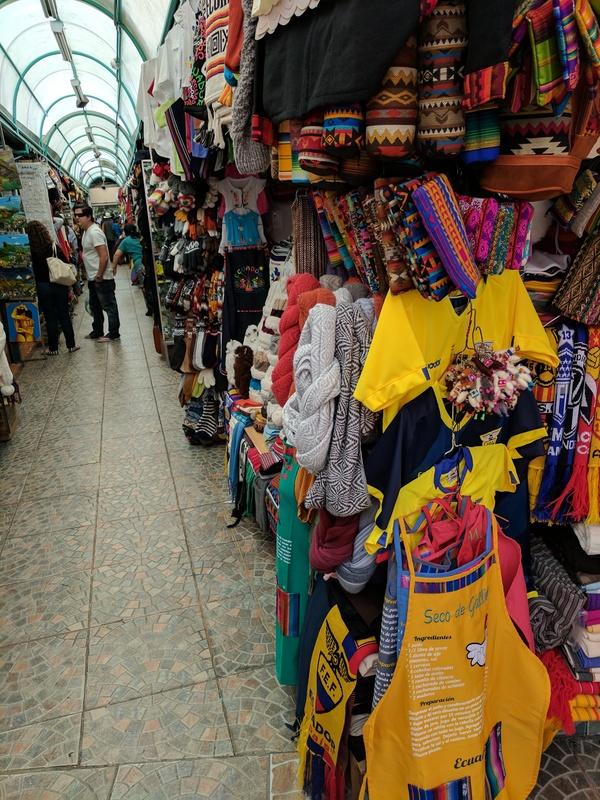 My wandering took me to a park with lots of mini markets, plenty of street food, children driving round in little metal cars, play areas like back at home and street performers. It was nice to sit and watch the world go by for a little while. The sun was beautifully warm and although at altitude again I wasn’t out of breath walking round for a change! After some food I was due to be picked up by the local tour group to head to the equator. 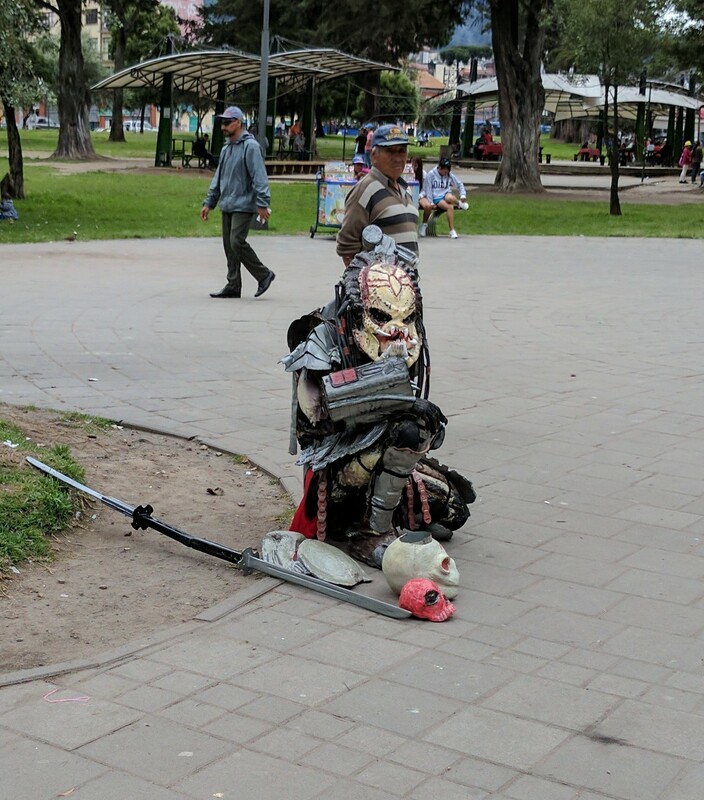 As per the norm in South America, they were late so I had the time to sit and do some more people watching….I got to witness some very bizarre conversations!!!! The bus soon arrived and I was on my way to the equator. 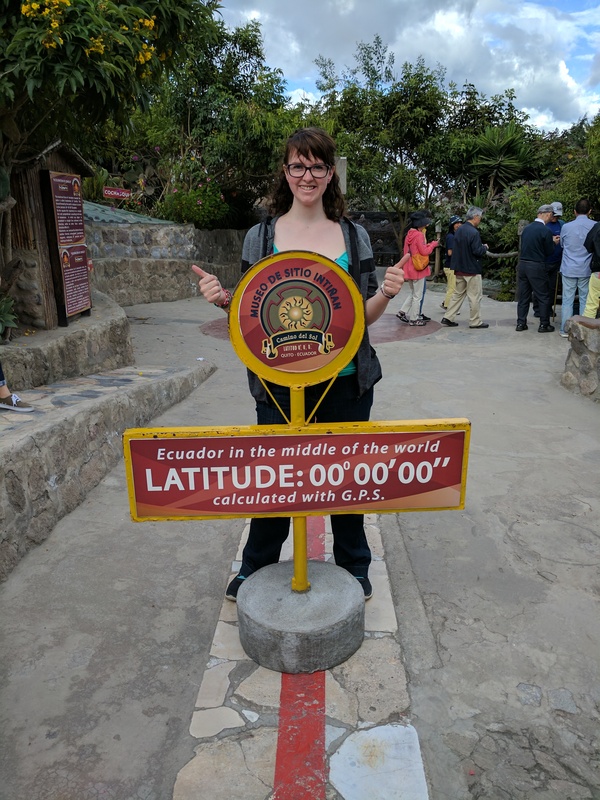 Here in Ecuador, they have two sites for the equator. 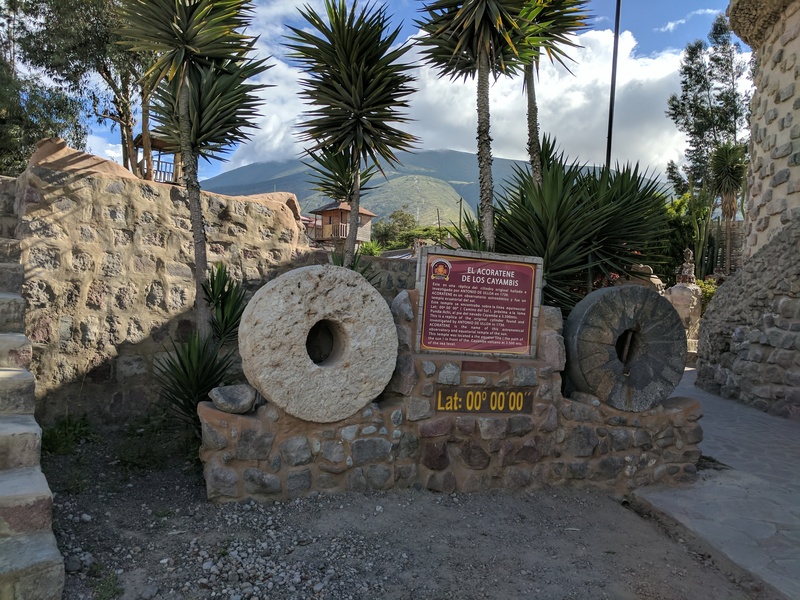 The original location where the main monument and buildings are erected and then the Intiñan museum where the equator was actually measured to be using GPS. 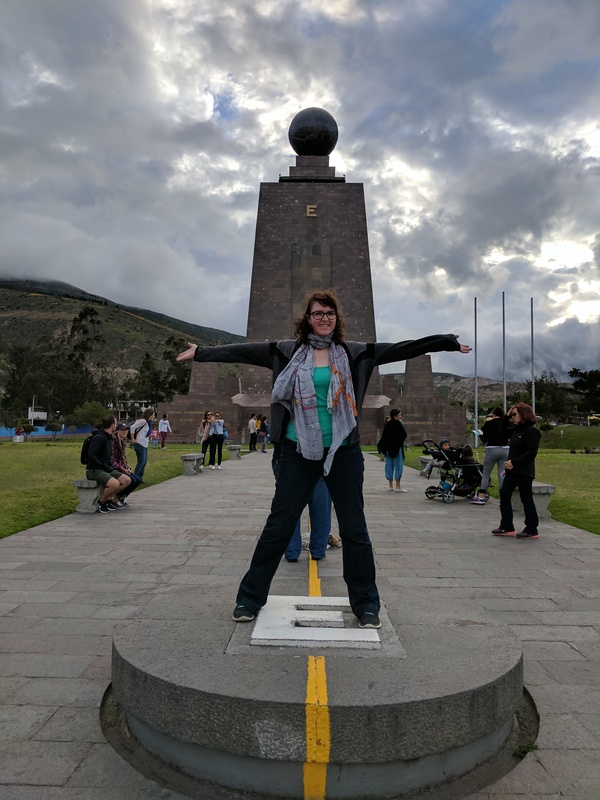 We started at the Intiñan museum with a tour guide showing us the equator experiments; the water swirling directions, balancing a fresh egg on a nail, testing the force of being able to pull your fingers apart or push your arms down and trying to walk the equator line, but looking like a drunk person. It was very interesting. She then told us about the Amazon indigenous people and how they shrunk heads, mummification and finally the origination and production of chocolate. 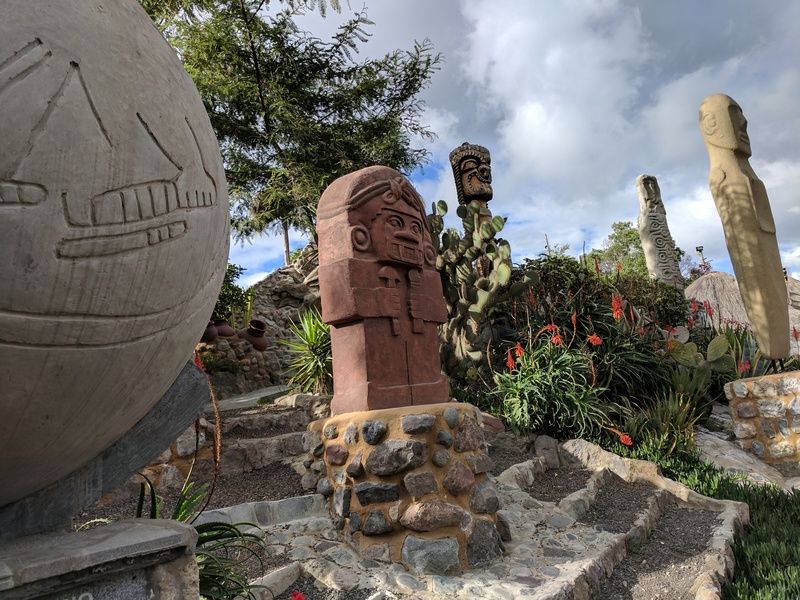 Did you know that the expression money growing on trees originated from Ecuador? The indigenous people were using cocoa beans as a form of currency amongst themselves and when the Spaniards came over, they were fascinated that money seemed to actually grow on trees here! Oh my goodness was the chocolate good…..I had to buy some! I haven’t had chocolate in such a long time and this stuff was so pure and everything free – I will definitely be enjoying a little indulgence on some salted chocolate. We were given a few minutes to look round at the totems that were there. Each totem was representative of a different country (most were South or North American). You could also go and get your passport stamped for being at the equator. Annoyingly, as advised, I hadn’t bought my passport with me. That’s Machu Picchu AND the equator I have missed now! I need to learn to attach my passport to me despite what people say. Back on the bus, we drove 5 minutes up the road to the official equator site. Unfortunately, we were only given time to get pictures and not to look around which I was thoroughly disappointed about. Still….I got to go there and get pictures….it’s better than nothing! An hour later I was dropped back at the main square where I headed to the supermarket to pick up some snacks for this evening and the next few days, before heading back to the hostel to pack my bits, call home for some love and get an early night. Surprise surprise, another early start tomorrow!